Further boys suit information is available at HOW TO BUY A BOYS SUIT, ABOUT US and WHY OUR BOYS SUITS ARE BETTER and WHITE COMMUNION SUITS pages. PLEASE CLICK ON ANY BOYS SUIT PHOTO TO ENLARGE IT. These photos do not represent our only styles, other fine wool boys suits are always in stock, depending on size. 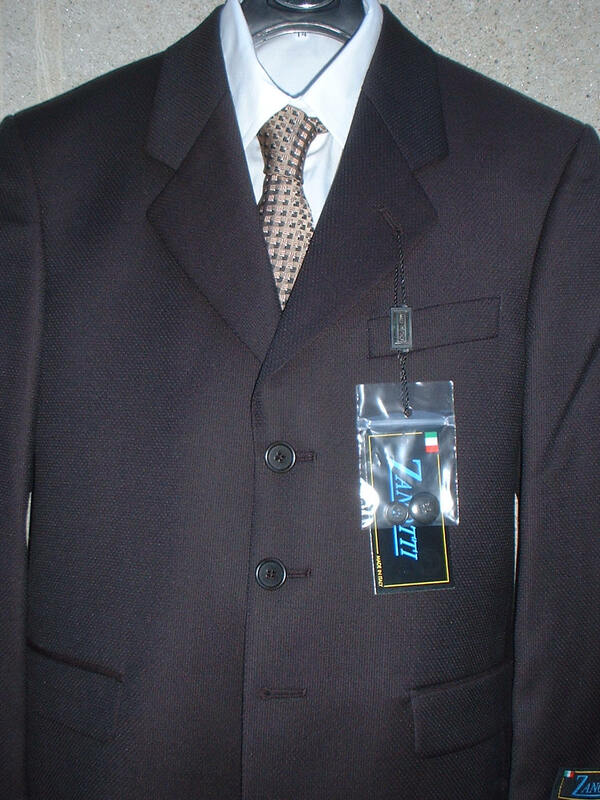 These suits are Made in Italy of fine Italian wool and it is very likely that your monitor will not show the smooth, flat finish of the wool. SOLID NAVY OR BLACK WOOL BOYS SUITS WITH FLAIR! These are our solid color navy or black suits for boys. We offer fine Italian solid color wools in faint pattern weaves or flat finish suits. These suits also are very appropriate for young men or small size men, short stature sizes. This group has been very well received by our customers, we often have had to rush large reorders to keep them in stock, these suits are among the best selling boys suits. We have also introduced a flat navy suit of tropical Tasmanian wool, it is very fine and great for special occasion use. These suits come in 2 button or 3 button version, please contact us if you have specific needs. All above boys suits are finely made in Italy of 100% Italian Super 100 or finer wool. SIZES 6-18, 2 PIECE BOYS SUIT AT $269, SIZES 19-22, 2 PIECE BOYS SUIT AT $279 ADD TO MY CART! 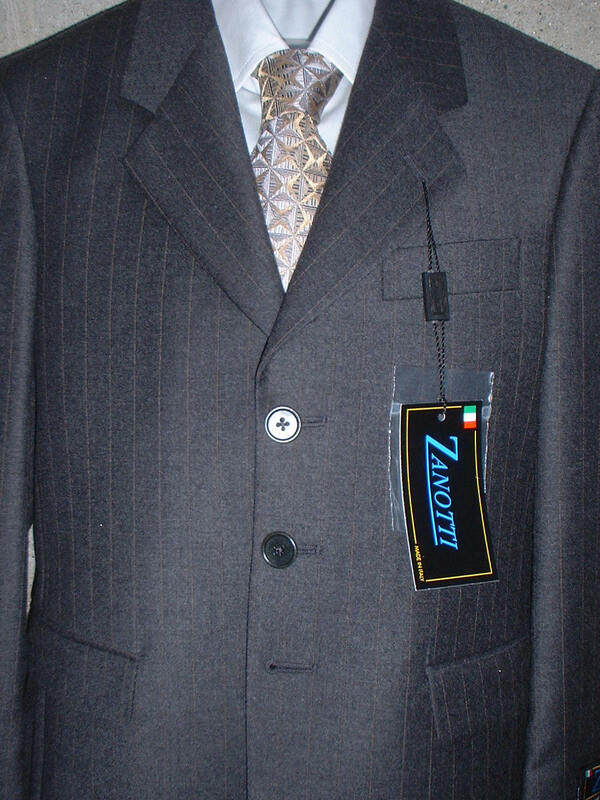 These are Italian wool pinstripe boys suits, fabric super 100 Italian wool by Italy's finest mills including Zegna and Trabaldo Togna, and Vitale Barberis. These mills are known for their fine wool fabric, any fine tailor will probably recognize the wools quality. Pinstripes are very in lately and with our up to the minute contacts we have the nicest of all. These boys suits are offered in 2 button as well as 3 button styles. Chalk stripe on navy, medium bold, also available in a muted version for those that want to keep things sedate. Blue stripe on navy. This adds a little novelty to a pinstripe. All above suits are finely Made in Italy, 100% Italian super 100 or better wool. SIZES 6-18, 2 PIECE BOYS SUIT AT $269, SIZES 19-22, $279, ADD TO MY CART! This is our fil-a-fil or end on end suit. This classic is spectacular for it's unique weave of differing shade threads in two directions, giving it it's name. Please note that this is not a navy blue suit, this weave requires a lighter shade to show it's colors! Yes, brown is a new color for boy's suits. We are ready with a selection of brown suits for boys in weave patterns and pinstripes and in a choice of two button boys suits as well as three button. All above suits are made in Italy of 100% new wool. This is our special navy blazer suit, available in several styles and as a blazer or as a suit. The fabric is finished with a special process which gives it an unusually rich appearance. 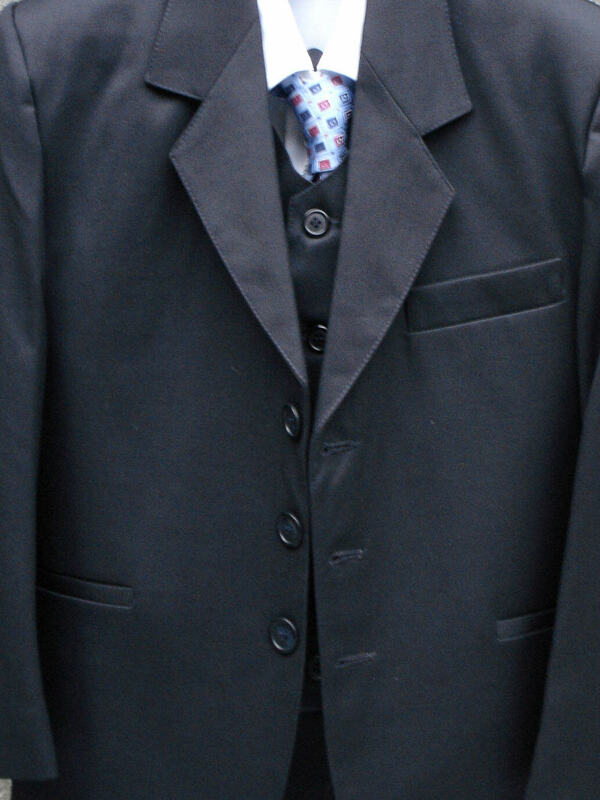 This is a photo of one of our youthful style single breasted suits, made in Italy to please the feelings and spirit of a younger child. PLEASE VISIT OUR YOUNGER STYLE PAGE! We are ready to help you select the right size, just phone or e-mail we will do all we can, including sending you a choice of sizes so you can be sure it's perfect, and we will absorb the extra shipping charges. 1, The jacket fit is the most important, most other variables can be adjusted. The ideal length of the jacket body, is to end at some part of the boy's thumb, preferably a little short of the edge. There is a clear exception to this rule on fitting a suit to a boy with very long arms, the suit need not reach to the mid finger. 3,Jacket length is measured along center seam on back of jacket, from just below the collar to the bottom. This is a great measurement to compare if your son has another suit, even if it is small. 4,The waist on most suits can easily be made narrower or wider by up to two inches. 5, VERY IMPORTANT-If the clothing seems tight and you would not expect that, carefully unload your child's pockets, they may have all his games and snacks for the week! 6, The shoulder width is for comparison to an old jacket, it is measured while the jacket is on a hanger, and measuring at the highest point possible, shoulder seam to shoulder seam. 7, We also carry Husky size and stout size boys suits, These are best handled by phone order. The suits are designed for a wider boy, the waist can be up to 6 to 10 inches wider than typical. boysitaliansuits.com, a division of Natan Borlam Co. Inc.